I have been wanting to try Sally Hansen Salon Effects Real Polish Nail Strips for a long time. 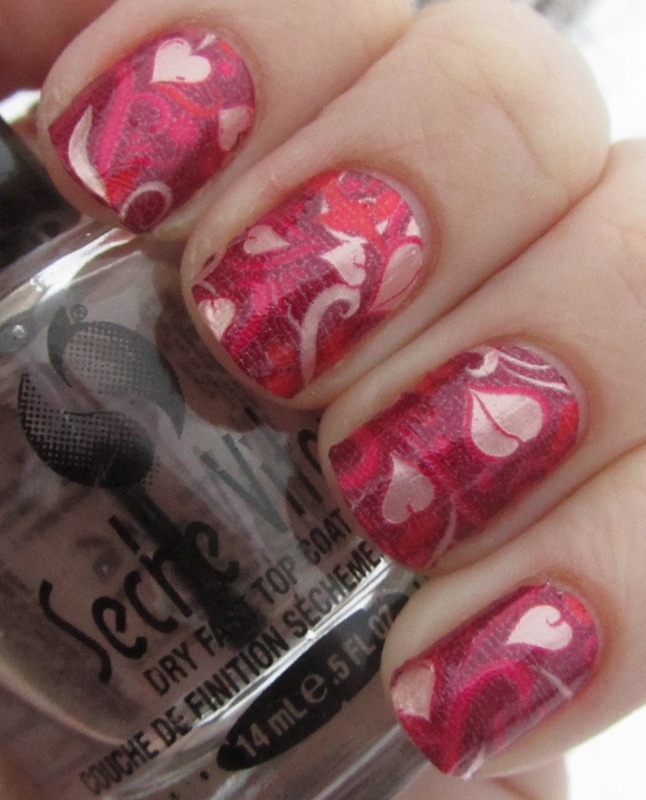 In fact, I have had one sitting in my nail cabinet for awhile, but I just never got around to trying it. Well, a few weeks ago in Ulta, they had a display of special Valentine's strips, and I decided it was a perfect time to try them out! I am fairly sure this print has a name - I think Are You Single? but I am not positive on that one. 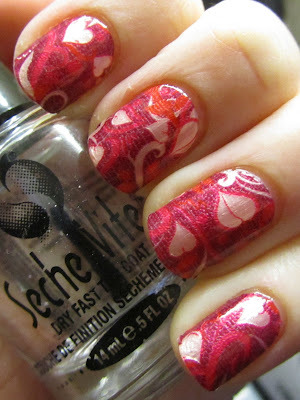 At any rate, it is a super-cute design in pink and burgundy and red, with swirls and hearts and it was just perfect for Valentine's Day! I found that it was pretty easy to find strips that fit my nails almost perfectly (I only had to do a tiny bit of trimming along the sides), but if you have very large or small nails this could pose a problem for you. Application was difficult at first because I was learning the best way to put them on, but by the time I got to my right hand I knew what I was doing better, what with the folding over the strip and then filing off the excess and all. Hope you all had a great day yesterday! lovely!!! i've only tried incoco ones so far... will try these sometime!